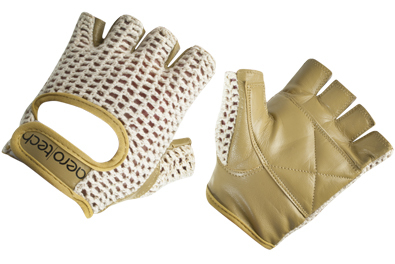 You will be thrilled with these cycling gloves. The palm is designed to fit around the handlebars to help alleviate numbness and to better absorb road shock. They are made from high quality goatskin leather in natural color that will not fade color. The palm of the gloves are padded and double layer. The back of the glove is crochet in pure cotton open-back crochet is cool and comfortable. The closure is Velcro. These gloves become a natural part of your bike rides. The high quality leather can help you wipe obstacles from your tire or pad the palms from small pebbles if you should happen to accidentally touch the pavement at high speed...oops. Cotton thumb for dabbing beads of sweat away from eyes. I'm 5'6" 155; ordered Large according to the size chart but gloves way too small. I'm going to return & see if XL fits me better. 4 rating rather than 5 because of only using the gloves once. This type of cycling glove has always been my favorite, as they are lightweight and allow abundant ventilation to the tops of the hands when riding. The only improvement that could be made to the gloves is a bit more padding under the leather palms. The brand of crochet gloves I used to by had heavily padded palms, but regrettably they are no longer manufactured. It will be interesting to see how this brand of gloves will last before the begin wearing out. Ordered these not for cycling, but for driving gloves. They have the padding where needed at just the right thickness. I have a pair of gloves similar to these that I have loved wearing for cycling, but after 25 years they have finally started to fall apart. I looked everywhere for a similar pair and these are the only ones I could find. They look great and fit well, but after less that 3 weeks the mesh at the thumb is already unraveling. Too bad. They're inexpensive, but I'd rather pay a few dollars more for a quality product. gloves fit perfectly, wanted the retro look and that's exactly what these are. Easy to wash and dry quickly, good amount of padding in the palm. definitely recommend if you are looking for a cool pair of retro gloves for the warmer months. These gloves are very well padded and solved my hand numbness problem on rides over 25 miles. You need these gloves! I like the feel of these gloves - the hands feel comfortable (breath through the crochet top). Natural leather makes them even more comfortable. They look a little big on my hands - but i deliberately bought larger size because I have big palms. Good value for the price. Very good breathability with these, but the leather on the palm is a bit thick/stiff for cyclists. Maybe it will soften with time, but after several uses including 3 hour rides, the palm is not my favorite. I like the light color though. gloves are super! description was lacking with 'sister pair' of gel gloves with padding....the leather biking glove seems to have the same feel and thickness as its gel sister. I bought both pairs, and would urge marketing to rate the thickness of each separately and publish it into the catalog description. The size is not quite true for me as it's a bit big around the thumb and my concern is that I'll get a blister but I've not worn them a great deal just yet. The palm is quite comfortable and that was what I was looking for. I have dupytren's contractures on my left hand making it painful for me to ride my bike and I believe the gloves will work perfectly for that. My old gloves wore out, but these Aerotech gloves are built to last. The sizing chart worked for me, and the leather palms are comfortable and durable. Works fine, keeps hands cooler than plastic modern gloves in my opinion. I had a pair of these gloves many years ago and wore them out. Now that I am riding again I searched and found them. These gloves are the best things for hand comfort while riding. I recommend them especially if your hands get fatigued or sore from your handlebars. Plus, they look good. Very pleased with the gloves, good quality, and a quick delivery. These are my first cycling gloves, so I don't have anything to compare to; however, they fit well and feel good. I can definitely tell a difference on long rides. They are great for summer because of the crocheting that allows breathing. They stretch out a little bit, but once they are washed and/or the sweat dries (ugh), they are back to normal. I ride a velomobile and a recumbent trike so I need gloves primarily to improve grip shifting and steering control when my hands get sweaty riding in hot weather; I do not need a lot of padding. These non-gel gloves are perfect. The leather is very supple with enough padding to be comfortable without binding. Also the leather does not contain a lot of dye like some other gloves I have owned. I purchased these to replace my old pigskin gloves and couldn't be more pleased. The goatskin is so much softer no need to break them in. I have been wearing them without any problems and will be sorry to put them away once the cold weather arrives. Use this model for mountain biking to keep grip surface size manageable. It also gives better feedback from the bars as the padding isn't so thick or squirmy like gel. I like to avoid synthetic materials and these have very little synthetics in them just the piping around edges. I would give them 6 stars if possible! I actually use these as work gloves for working with portable fence on my farm. They fit the bill for comfort and durability, and the padding helps prevent aggravation of my wrist pain when gripping (and afterwards). I could see cycling in them all day, though I haven't tried. I was exactly between a large and medium size according to the website. Glad I went with the medium, fits perfectly. Also the leather will most likely stretch over time so smaller is better. Use this model for mountain biking to keep grip surface size manageable. It also gives better feedback from the bars as the padding isn't so thick or squirmy like gel. I like to avoid synthetic materials and these have very little synthetics in them, just the piping around edges. I would give them 6 stars if possible! I bike twice a week 15 to 25 miles. The gloves work great. I had to return for one size larger. Easy replacement policy. No fuss. Very well made and light weight! I bought these for my girlfriend because she wanted a light weight breathable riding glove for recreational use. She looked everywhere but without success until we found these. We just got them so we don't have much experience but she likes them so far. I bought these for mountain biking and realized they'd be fine for road biking too. I get lots of comments from riders who know what they are and I've already recommended Aero Tech to friends. Thanks for the look! My husband and I are so pleased to be able to buy these gloves like we wore years ago. These are improved from the first version we bought from Aerotech better cut and better fit. We prefer these gloves for our mild weather road rides and commutes. I'm ordering another set for us and we give them to friends as gifts too! excellent delivery time, performs as advertised. even at 25degrees, collects A LOT of sweat on the inside with ONE ShortSleeve layer underneath (even unzipped all the way with single short sleeve layer at 25degrees, arms are soaking wet after 10miles). havent tried it at below 25. ONLY "TALL" SIZE WATERPROOF CYCLING JACKET ANYWHERE.